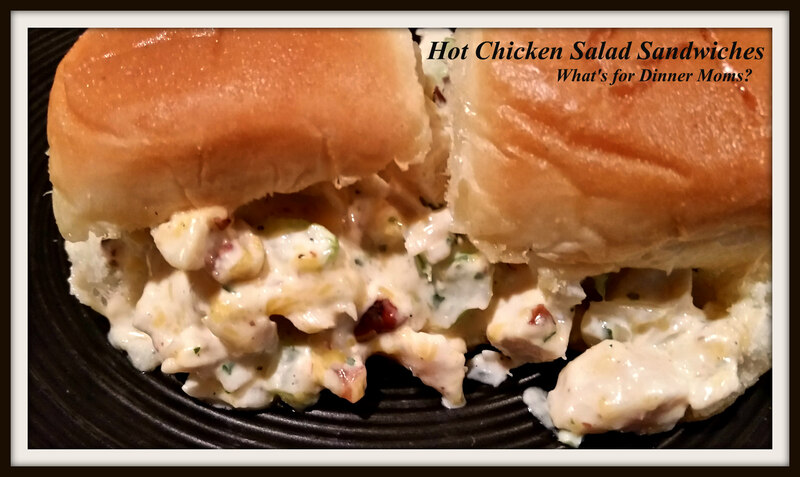 Hot Chicken Salad Sandwich Sliders (on Hawaiian Rolls) – What's for Dinner Moms? More of these little sandwiches. They are so versatile you can fill them with almost anything you can think of to get tons of different meals or hearty appetizers for a party. These can also be made with cold chicken salad but with the cold weather it seemed much nicer to me to have a nice hot bite while watching the game. I am a Buffalo Bills fan at heart even though we moved away and their first playoff in 17 years had me looking for ideas to serve for a fun gathering. I loved these little sandwiches. My kids thought they were good but they prefer the cold chicken salad. They are not a fan of the hot mayonnaise chicken salad. Plus, they would have preferred them without the flavoring. I thought they were yummy. 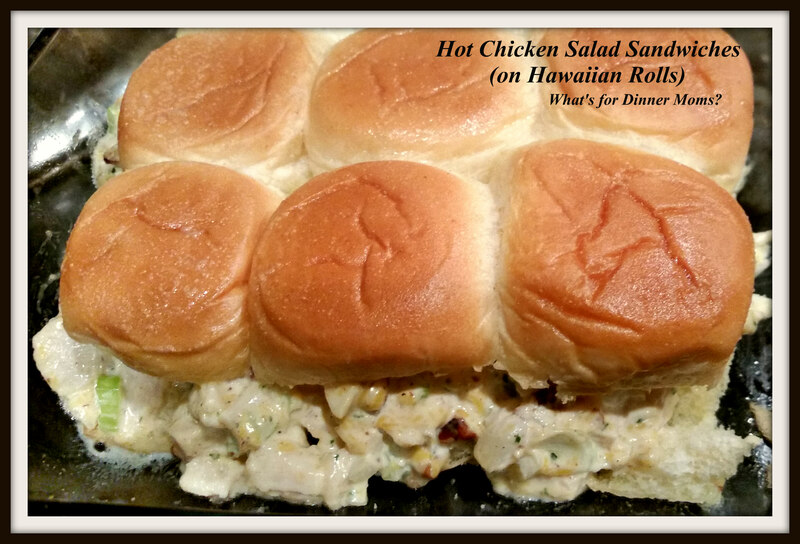 If you don’t like hot chicken salad it can easily be served cold or change the rolls if you prefer not to have the sweeter Hawaiian rolls. Preheat oven to 350 degrees. Lightly spray a 13″ x 9″ pan with non-stick cooking spray. In a bowl mix together chicken, ranch dressing mix, lemon juice, black pepper, celery, onion, mayonnaise, cheese, and pecans until well blended. Taste and adjust flavors to your liking. Slice rolls horizontally so you have a sheet of tops of the rolls and a sheet of bottoms. Place the bottoms of the rolls in the casserole dish. Carefully spread the chicken mixture over the rolls. Cover with the tops of the rolls. Brush melted butter over the tops and sides of the rolls. Bake for 20-25 minutes until chicken has heated through and rolls are golden brown. Remove pan from oven and serve warm. Previous Post Disney Planning, Again! Great idea, Marci! I love your slider recipes!! Thank you so very much, Erika! Oh my! This sounds delish hot or cold! I’m fantasizing about little triangle cold sandwiches with this filling right now! I haven’t had much appetite today, and now. NOW! I’m hungry! Thank you! Hope you like it. These sound like great school lunch box sandwich ideas, Marci. I like them hot or cold, the Hawaiian rolls do it for me.Thanks, Marci! Thank you for being such a great supporter of me and my blog! You’re welcome, Marci! I really enjoy your creative food ideas and your fun family posts! Thank you! I love it is a quick easy meal that the kids enjoy.